I Want to Make You Jealous . . .
Because I want you to feel this happy. If I looked down to my right . . .
My girl Sky, who is feeling great again after hurting her back last week. She had a bad landing from one of her amazing leaps into the sky (from which she got her name). Huskies are not normally jumpers. But, since she was a puppy, this one leaps about three feet straight up when she is excited. I would make a video, but I discourage her from doing it. Someday, she might land wrong and pull something. Well, she did that last Monday, and we babied her all week until she felt normal again. I’m still not taking my eyes off her. which is easy since she is velcro-ed to me, it seems. And if I looked left . . .
Two of the beautiful Begonias from AJ’s Nursery in Durango – and my favorite Chardonnay (Woodbridge by Mondavi). Not expensive, just light and delicious. And if I looked straight ahead . . . I am so filled with gratitude because who could ask for more? This little piece of paradise does so many things – it soothes my soul, makes me feel the spirit in Nature, overwhelms me with beauty, and totally inspires my art. I work myself to pieces reestablishing this space every year, but it occurs to me, when I see and ponder the elements, that anyone could make themselves a little space like this – a tiny piece of heaven. A few years back, my brother lived in a high rise in Houston called Bayou Bend. It was a pretty ritzy place with doormen and all that (they always got a kick out of me and my flip flops), and very beautiful. But, each condo had only a postage stamp size balcony. My brother never went out there, but there was a small chair and table set and a dead plant. As beautiful as the building and the condo were, it lacked something essential to anyone with a soul because there was zero connection to Nature. I couldn’t stand it and I sat out there with my coffee each morning. Eventually, he joined me. The view was beautiful – overlooking Memorial Park and the green of the bayou. “We need to do something with this,” we both agreed. It only took a day, some beautiful plants in two containers, cushions to make the chairs comfy, and a small fountain. Combined with the beautiful view, we had turned a concrete ledge into a little piece of heaven where he could meditate and soothe the stresses of his high powered executive days. This soon convinced him to sell the condo, by the way, and move to a beautiful home on the bayou with a BIG yard. The point of this story is that no matter what your circumstances, there is probably some small spot that you can turn into your sacred nature space. It does not cost much and you do not have to be a gardener. A comfy outdoor chair, and a little side table for your wine, tea, or art supplies. As many containers as you can fit, filled with annuals from the nursery, or from Home Depot, Lowes, etc. Your pots do not have to be expensive or large. Plain terra cotta pots are beautiful with greenery and flowers. Pour in some potting soil, dampen with water, and set the plants in it. Pour water from a pitcher or pretty watering can into your containers as often as necessary. This is part of the lovely ritual of being in your Nature sanctuary. Cut off dead flowers, so your plants will keep on flowering. Use some cute little scissors that you keep right there with your pretty watering can. I know of an instant fountain that sounds great and looks great. All you need is a bowl big enough to hold 1-1/2 inches of water and the pump below. A birdbath works perfectly, but any container will do. You don;t need to go hunt up the right pump and rocks, because they come all in one, and look like this . . . This is how it looks out of the box. Here’s a shot of one of mine with a little patina from use. I have this one in one of those plastic pot saucers. The sound is wonderful and attracts birds. You do need an electric outlet, but it uses only about 4 watts of electricity. There is a solar version available, but it is three times as expensive. Figure out some extension cord trick instead. I even put one out a window once. Amazon has this fountain for $38 and change with Prime free shipping. However, when searching for the best price online, I discovered a Lowes company I had never heard of – which carries *everything* at great prices and with free shipping. Their cost is only $32 and change. So, for very little money and time, you could have a magical outdoor space that calms you, inspires you (draw some of your flowers – and their leaves and buds etc.) and connects you to the nurturing power of Nature. Try it. It’s the kind of thing that grows on you (so to speak) and you may find yourself expanding your sanctuary as the Summer goes on. Sorry I can’t figure out how to share my view of the Rockies or my dog. I would if I could. This entry was posted in Creative Inspiration, Gardening, Projects on June 11, 2014 by jessica. 2013 has been my most challenging year in the garden – ever. We started the year with a prolonged drought, and then, a month ago, the monsoon season started with a vengeance. We have not had such a heavy monsoon season in several years and everyone is glad for the rain. But, as I mentioned a few posts ago, every rain this year has ice cubes. Most of the hail storms barely miss us, passing to one side or the other, but one that hit early in the season did a lot of damage and made me start thinking about how I could protect my precious plants. Someone suggested shade cloth and I bought many yards and made covers for some of the plant stands . . . and it was protective, but I couldn’t see the plants at all, and the garden looked like a ghost party. What’s the point of having a garden that you can’t see? Or ghosts that you can see, for that matter. Since these storms have been coming through daily, I needed a solution that would not be quite so extreme. I don’t know why, but I thought of nylon net. I didn’t want the garden to look like a wedding party either, but they make nylon net in a dark forest green and a taupe-y dark brown. I bought 36 yards and a couple of packs of wooden clothes pins. This worked great. I could see the plants, they could get light and air and water, and hopefully not get hurt by hail. The garden certainly does not look normal like this, but there is a surreal beauty that I never expected. This last photo shows you what the shade cloth looked like too. And it shows all the Hibiscus wrapped with the pillars of our portal. The nylon net folds out to a 72″ width and cuts very easily with scissors so it was easy to make a cover to fit all the different beds and planting arrangements. I attach the net with clothes pins to trellises, the edges of pots, tree and shrub branches, and everything else that is handy. I put plant stakes or something in the containers to hold the top of the net off the plants. I take the net off for as long as I can for the Bees and Hummingbirds etc. and put it back on whenever the radar tells me I must. It is a ridiculous amount of work. I have been doing this since late June. A week ago last Friday, there were no storms in the forecast. I took the netting off. Mark called me over to watch the gallery while he came home to meet a plumber we had fixing a leak in the water line to the new refrigerator. While I was at the gallery, it started to rain – big drops – which means trouble. I called home to tell Mark to get the dogs in and cover the plants as fast as he could. It just so happens he was on a run to get parts for the plumber. We got flooding rain and very bad hail. Wet dogs, flooded yard, lots of damage to plants. Almost a month I had religiously protected every vulnerable planting – and there they all were left undefended when the hail hit the fan. They were very mad at me. There is great irony in this tale, and probably some lesson about control issues, but I did a lot of wailing and weeping and could not tell what the lesson might be. I also didn’t feel like controlling all the wailing and weeping. Then I dried the tears and started the clean-up and first aid. And promised every injured plant that I would not let this happen again! The silver lining in this event is that I had left the netting on two trellises and those plants did not get a bruise. And that was BIG BAD hail. If you live in an area that is threatened by hail this Summer, you might want to try this on your most precious plantings. The garden has valiantly recovered in the last week and a half. Nature is an amazing thing. As new leaves grow, I remove the torn ones. For two days now, there have been no storms on the radar, and the Bees and Birds have been having a great time. However, I am going out right now to put the protection back on because we have more T-Storms in the forecast. This is anything but relaxing, but there is a weird beauty to a garden draped in veils. I have been doing some searching. The Triplus Marker Set I have with the 1.0 tips can be found at this website for a VERY good price. AND . . . I saw three packs at my local Staples store – in the children’s art section where the Crayola stuff is. So, everyone who wants one of these sets can still get one. I was also searching my art supply drawers and found an old set of Pentel markers. I tested them and they work great for the marker painting too. 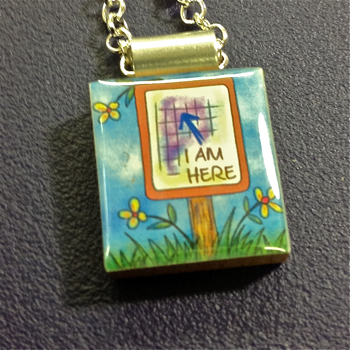 This entry was posted in Art Supplies, Gardening, Projects on July 31, 2013 by jessica. A Scarf in a Pot . . .
Scarves are so popular these days and the silky ones for Spring make a beautiful gift. So, here’s an idea that adds extra gifts of a coordinated scarf clip and a flower pot – all in one clever package. I put a number of these together for my gallery for Mother’s Day, but this would make a great housewarming or birthday gift too. The message washes right off the pot rim after the gift is “opened”. Let’s look at what it took to make this blue one. That’s all there is to it – and you still have time before Mother’s Day. Back from the Road Trip . . . I know I promised to try to share along the way. I also thought this would be a relaxing “vacation”. Not so much. Do not go on a “relaxing” vacation with a friend (Valerie) who is a creative whirling dervish, and a gallery owner like yourself. Somehow, the synergy keeps you up at night! And then don’t go with that friend to visit your other gallery owning friend (Vesta), who is a perpetual creative explosion of some type. OMG – I was quite sure my head would blow up. After having such a great adventure with V and V, I need some R and R.
It was a fabulous trip through Ruidoso, NM and White Sands, Tubac, Tucson, Scottsdale and Sedona. I will share as I get the photos and art journal pages organized. Meanwhile, hope you like the Scarf Pot. This entry was posted in Projects on May 8, 2013 by jessica. My Newest Project . . . This, of course, is not a new idea, nor is it my idea, but it’s a great idea, and I’ve been meaning to play around with it for a long time. 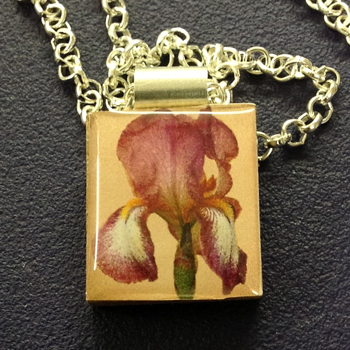 These are pendants made of Scrabble tiles, photographs, and resin. I make the aluminum bales myself because I like the look better than the ready made ones, and I can center the bale over the tile totally so it doesn’t want to hang weird. 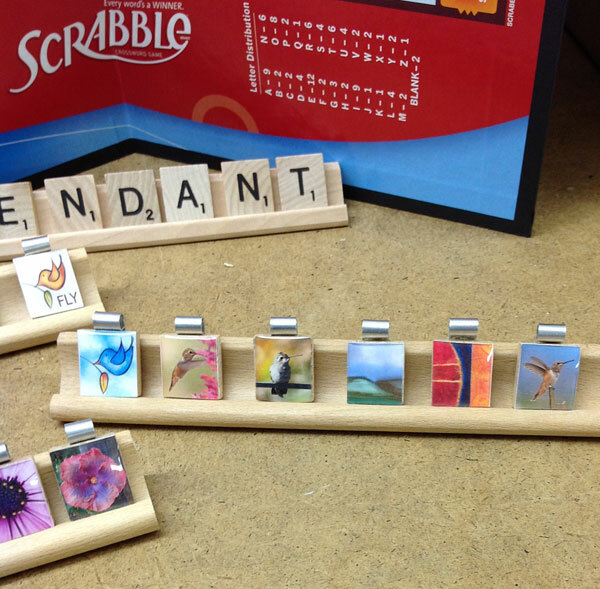 I made a display for the gallery (which I will photograph for you), by standing the game board up behind the pendants, which I set on Scrabble letter trays. Chains are hung from S-hooks over the top of the board. They have been selling very well. I have been having as much fun creating displays lately as I have been creating product. Here are a few of my favorite pendants . . .
Obvously, I’m using my own art and photography for these. One thing leads to another, and I get so many requests to reopen a gallery website (which I just cannot afford the time to do), that I decided to add a Gift Gallery to Cre8it.com. And the first thing in it is . . . good guess . 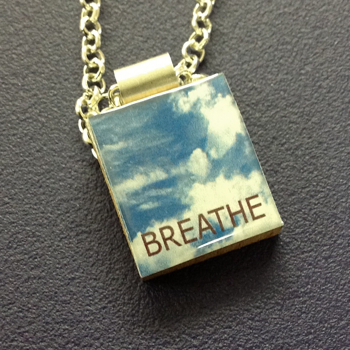 . . the Scrabble Tile Pendants. I have 29 of the design styles there so far, and there are more to come. They were already in the gallery and I didn’t get a chance to photo them yet. Yes, of course, some of the Hibiscus are in that bunch. I took all the photos with my iPad 3 because using the good camera would have meant all kinds of lighting tricks. The iPad camera is quite miraculous for this kind of photography. Have you ever tried this Scrabble tile thing before? I am gearing myself up for a blogging challenge – to blog every day in December. I know there is a big movement online that has everybody blogging every day in November, but I never quite get with it in time. I am sure some of my posts will end up a little lame, but I have to get into the habit of this somehow. If I can do it in December, then I should be able to do it anytime! I’ll be practicing until then . . . This entry was posted in Projects on November 20, 2012 by jessica. Candles in the Wind . . .
My life is so darned interesting lately – I’m going forward and backward at the same time. Some might call that “getting nowhere”, but I beg to differ. You should try it – it’s entertaining. In the process of distilling my art life, I am purging and sorting, and exploring backwards to find what I want to bring forward. It is interesting how much I once found interesting, that does not interest me now. And how much does. And that is what I will share with you in one way or another. The stuff that does. So, with this holiday coming up during which so many will share table space, I am bringing this idea back around. It’s a bit gothic, but extremely beautiful, and quite the conversation piece. 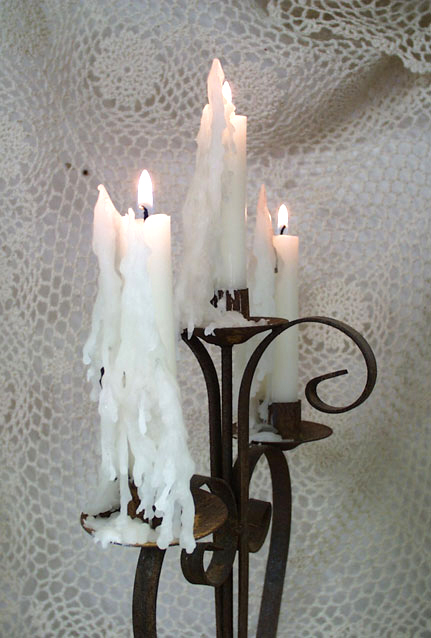 You start with a candelabra of some kind, and some taper candles that are NOT dripless. Then you burn them in a gentle breeze for awhile. Gentle breezes may be hard to come by at this time of year, so a fan will do. You don’t want to blow out the flames, so take it easy on the fan speed. After a couple of hours, you will have some fine wax sculpture. OBVIOUSLY, do not leave this work of art unattended. I first made these for our garden themed gallery in Santa Fe in the 90′s, and I have to admit it was an accidental discovery. We had two open doors in that gallery, which created a lovely breeze most days. I was burning candles and this is what happened. One of those unexpected gifts of Nature, so I will pay it forward. Interestingly, that was the same gallery breeze that invented Sheer Heaven – because it blew the handmade paper luminaria shades around, and I thought they needed more substance. You never know where your thoughts will take you – forward or backward! 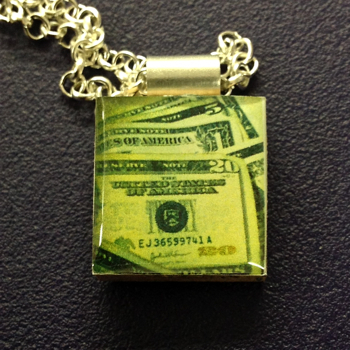 This entry was posted in Just Thinkin, Projects on November 17, 2012 by jessica. 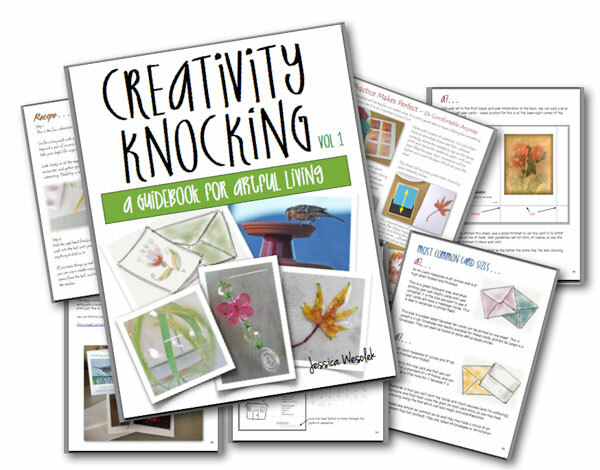 Creativity Knocking – Volume One! Well, October was not blogging month around here! So much has happened since last we spoke, that it would take a whole lifetime just to list it, let alone talk about it. You know how I don’t care for the reciting of TO-DO lists, especially the ones with capitol letters, so I won’t be doing that here. I’ll be sharing some of the more interesting stuff as it becomes relevant, because I will be blogging a LOT more, but I won’t make you sit and listen today. But one thing does stand out from this past month . . . I figured out what I want to be when I grow up! But, truthfully, I don’t get to *BE* an artist that much. I am much too busy BEing a crazy person instead. As you know, I have a gallery. Therefore, I have a destination for anything I create. Truth is that Mark and I will not do this again, so this is it, and I must take advantage of the opportunity and make art! If not now, then when? So, everything I do must dovetail into that. Lucky for us all, I love to keep an art journal, and so it makes sense that I journal the details of my ideas, endeavors, and adventures in my art making. Right? And I have been doing that. And I put the first completed journal into a PDF Workbook. And I just published it – for your creating pleasure. One of the things that went on during October is that I ran out of gas – me, not my car. Since our Borders is closed, I drove all the way to Albuquerque to go to Barnes and Noble, have some coffee and look for inspiring art books and magazines to buy. If you would have told me 10 years ago, that almost all VARIETY would pretty much disappear from art books and magazines, I would never have believed you. I could see where that could happen in some fields of publishing, but surely not CREATIVE publishing! I came home empty handed. But I have hopes for my own personal inspiration via blogs, Pinterest, etc. For you – I can give you something exciting and inspiring in a workbook! It’s really more of a “Playbook”, but that sounds like football. And it’s not about football. It’s not a magazine. By their nature, they must move briefly through subject matter and be full of advertising. It’s not a book because it’s not about a single subject. So, I decided to call it a workbook’guidebook. Creativity Knocking is just what it says. It’s a VARIETY of creative ideas, idea starters, and idea finishers. It should give you lots to think and do, and hopefully, start you down some paths that I haven’t even thought of yet. I love it and I am not going to put a schedule on it so I can continue loving it. It is a part of the “art” I am making, and part of the “art” I have made. It is fun. It is inspiring. And I hope you love it because I want to do many more volumes. Without further ado, here it is . . . This entry was posted in Art Journaling, Art Supplies, Learning, Projects on November 5, 2012 by jessica. Time On My Hands . . .
Well, you KNOW I can’t be saying what that title sounds like I’m saying, right? If there were any extra time around here these days, I would sleep! Not sit around talking about it. What I mean is “time on my hands” literally . . . 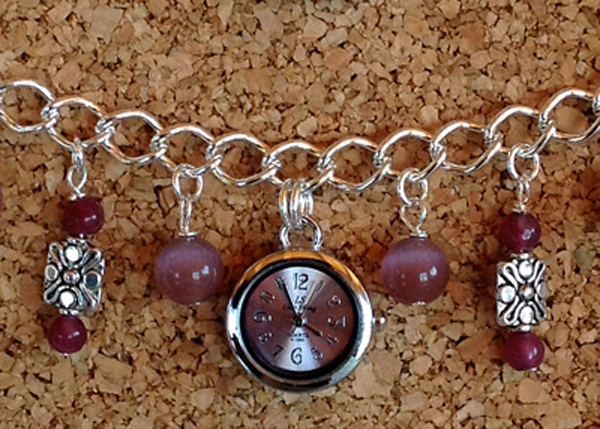 In Tucson last February, I was blessed to run into a guy who had some watch charms. 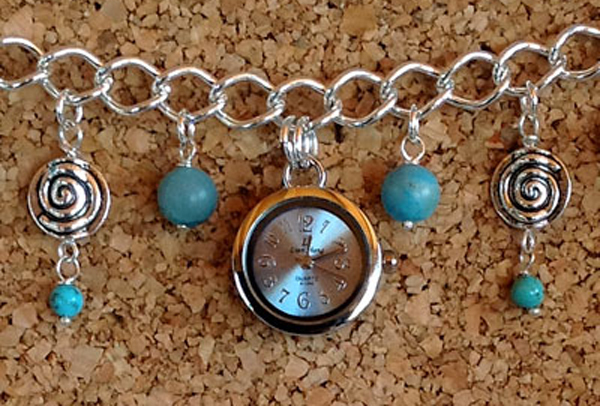 There are watch charms all over the place, but the keyword here was WATCH. They really work – they really are a watch. I have made a few so far – Here’s another (these are just detail shots of the middle section) . . . 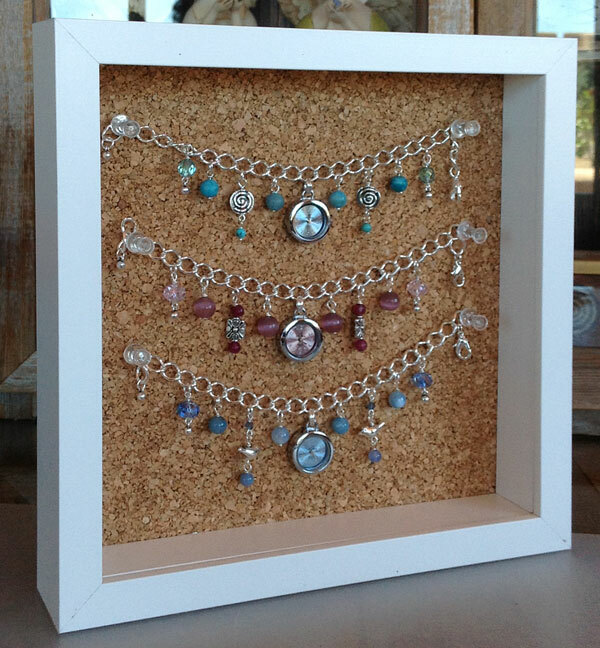 Displaying a dangly bracelet is challenging in a retail setting. You have to arrange them just so, and then as soon as a customer tries them on, they end up in a messy heap. I thought up a great display idea that I want to share. I think it is pretty “uptown”, but it was inexpensive and easy to do. This is a cork tile (from Amazon) in a shadowbox frame (from IKEA). I had to trim the 12″x12″ cork tile to fit, but that was easy enough. This will stand on its own or hang on a wall. I love the way it looks, and I just know I am going to come up with additional ways to put this to work. So, about the website . . .
Everything else must be put aside until it was at least mostly done. So, poor me, I had to set aside all the fun of downloading videos from MobileMe to save them from a horrible death, and building elaborate defense mechanisms for my poor Morning Glories to save them from a horrible death (cages and sticks and black pepper and cat clumps, and something is STILL eating every shoot that escapes the cage, and makes a run for the trellis! Grrrrr!) Suggestions? Anyway, all that had to be put on hold while I returned to my website project. I wasn’t even allowed to have my Sunday morning coffee!! I put the Watch jewelry and the hand-stamped pendants I showed you before on the site, and I put most of my gallery card shop on there, and I haven’t quite developed the photography section yet, which will be done as an incorporated WordPress site so I can show the photos the way they should be shown. But, I would love for you to visit, and make sure it is all working (except the photography). The idea is that I will have a place to showcase and sell my own art – the stuff I create for the gallery, and maybe some work that won’t even go to the gallery. Anyway, so far, so good, I think . . . This entry was posted in Projects on June 19, 2012 by jessica. Every Tuesday will not contain a Photoshop/Elements lesson because I could not put that kind of obligation on myself, but I was fooling around with this today and I thought I may as well share. I found a website where a Brazilian designer gives away a texture each Tuesday. I thought that was nicely coincidental. There are quite a few Textures on that page to choose from, and she has many more in the archives. What do you do with textures? That is a good question, and I can give you a couple of answers. Your own creative instincts will give you plenty more, I am sure. I downloaded this Texture from the site. Although the Textures offered are 300ppi, the size is only about 2 inches wide. So, you must Resample the image to match the size of the photo you want to use it with. Both the Resolution and the width must match. The best photos for this effect are ones that already have some personality going on – personality that will be enhanced by the texture. I took this Sun Face photo in Indiana back in 2010. The lighting was not ideal but I like the color and the concept of a “sun” in shade, and the crescent moon shape of the shadow spoke to me as well. This photo is approximately 8 inches wide so I sized the Paper Texture image to match. The next step is to drag one file into the other. (If you do not know how to drag images into each other or to deal with Layers, you need my Photoshop Elements Kindergarten Workshop). When you drag one file into the other, it will come in on a Layer of its own – above the original. So, there are a couple of choices to make that will yield different results. I first dragged the Paper Texture to the Sun Face file. I selected the Paper Texture Layer and changed the Normal Mode to Multiply. This results in only the parts of the Paper Texture that are darker than the photo to show. I really liked what happened here. You can fine-tune the effect with the Opacity Slider for the Paper Texture Layer. I used Save As to save this image without affecting my two original files. Then, for a different look, I opened my original photo again and dragged it over to the Paper Texture file (which was still open). This time the photo is on top of the texture. I played with the Opacity Slider for the photo Layer to allow some of the texture to show through (about 70% Opacity for the photo in this case). This creates a much softer and muted version . . .
And, it’s a little too muted for me, so I used the Unsharp Mask Filter at 165 (Radius of 2.3) to create this version which I like a lot better. Here is a comparison of the original and the two textured versions, so you can see the very different reults of the two methods . . .
With the variety of Textures provided by Tuesday Total Textures, and all the images in your own stash, it could be awhile before you run out of interesting art images!! You can create your own textures by taking photos or scanning things too. A Gift for You . . . Recent versions of Photoshop and Elements have maddening workspaces which lock your photos up in a framework of clutter – making it VERY difficult to work with more than one file open and see what you are doing. I can’t stand it, so I put together a little PDF on how to slap that workspace into shape. You can always put it back the way it was, but I don’t think you will want to. Hang on to this PDF. Next time I will show you how to read PDF files as iBooks on your iPad and maybe your Kindle or Kindle App (if my sources are correct, you can do that now. You could not do it before, so that would be a happy addition). This entry was posted in Learning, Photography, Projects, Tech Tuesday #1 on January 3, 2012 by jessica.